We are planning a trip to Lake Annecey in the Roadster with friends in Healey 3000's later this year. as to the situation regarding cars over 20 years old actually having a Crit'air issued as well as the requirement to scan & submit the Roadster V5C as an attachment with the application as there is a limit to the size of the file to be sent! 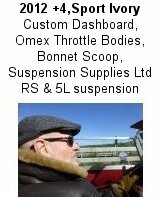 Has anyone had any experiences of travelling to France in a 'classic' over 20 years old & anyone succesfully applying & obtaining a Crit'air for newer cars? See the thread at Post number 498163 on 08/02/18. Have you read the advice on the RAC website? The AA probably offers similar clarification. “although if you have a particularly old car that does not conform to any emissions standards, you won't be eligible for a vignette and you won't be permitted to drive your vehicle during those times when restrictions are imposed“. Just make sure you avoid the restricted areas. As to the file size limitation, reduce the resolution when you scan your V5. I got one for the Roadster S1. I just scanned the inside of the V5C. I got back a Crit 2 sticker for just of €3.11 it seemed worthwhile as we may go into Strasbourg. All this was a bit new to me and given that we go to France quite a lot I saw it as important. At first I thought it only applied to the centre of Paris and Lyon, a bit like Milan. My impression was also that it was a useless bit of bureaucratic nonsense as in Italy they simply use the Euro category for this purpose. However, after a bit of research, I can see the sense of it. But also I see that the number of zones and cities that require the Crit'air sticker is ever increasing. The main thing that anoys me is that it should apply to the whole of Europe. If every country does its own thing it finishes up a lot of hassle for people who travel a lot. I also found that there are sites offering the service at vastly inflated prices. To echo John V6 earlier make sure you are on the official site. My crit air cert came through a couple of days ago. Annoys me to admit it, but this French site seemed to work rather better than anything from the DVLA would - even the English was good. As for file size, I scanned the V5 whatsit and then used the free graphics program Paint that comes with W10 to reduce file size. Its not clear where in froggyland the cert is needed but for the small amount of money involved and because I didnt want frog marching ( see what I did there! ) off to a cash point for not having one when I should have one, I got one. "No order possible for passenger cars having been registered before 1st January 1997." Got one for the tin top without any problems. Use the Green-Zones smart phone app. Don’t use it to apply for the Crit Air badge though. Thank you for the responses, seems 'we' Morgan owners will be OK for the trip, the Healeys won't!